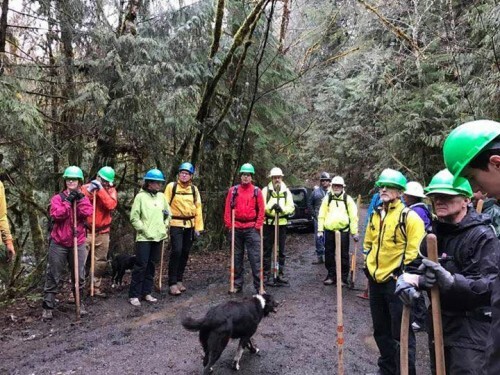 We had 30 volunteers show up on a drizzly Saturday in the Willamette National Forest. A variety of projects and tasks were undertaken including crib wall construction, tread restoration/drainage and enhancements, as well as a culvert installation. Tacovore, Oakshire and Planktown provided refreshments at the end of the day and a huge chocolate cake brought by club member Pokie-Jim was devoured. It was a fun/wet/wonderful day in the woods! Thanks to all of our amazing volunteers and sponsors for making it happen. More pictures over on Facebook.